Pakistan's international limited overs teams have had a ball for past year and a half. The T20 international team is the number one ranked team, and while the ODI team is still in the middle of the table at number five, it has had a magnificent run since the Champions Trophy last year. Since June 2017, Pakistan have the second best W:L ratios among the 10 ODI teams that will be participating in World Cup 2019. 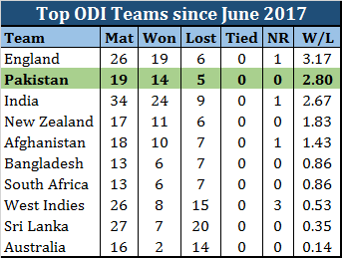 Only England has a better record than Pakistan during this period; however Pakistan has lost the least number of ODIs in this time among these teams. Pakistan's successful run during this period has been helped by the induction of some fresh blood with the likes of Fakhar Zaman, Babar Azam, Hasan Ali, Faheem Ahraf, and Shadab Khan making great strides as match winners. There are various cricket betting sites around and if you are a betting person, you could have made a fortune by placing bets on Pakistan wins over the past year. It is no surprise though that these match winners have been born under the leadership of Sarfraz Ahmed. While his antics on the field may display nervousness and temper, Safraz has grown as a well respected leader within the Pakistan dressing room. 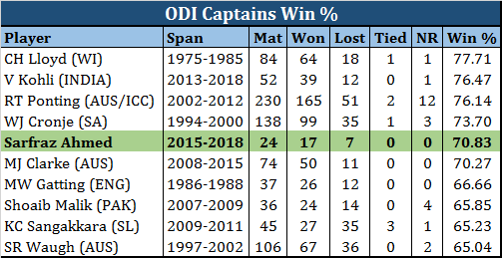 This recent success that Pakistan's ODI team has had has led Sarfraz Ahmed to the top of the heap among Pakistan's ODI captains. 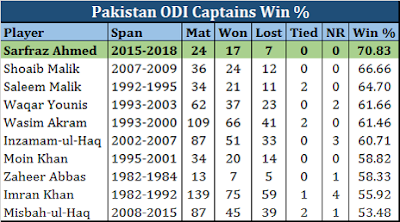 His Win % of 70.8% is the best among all captains that Pakistan has had in ODIs. 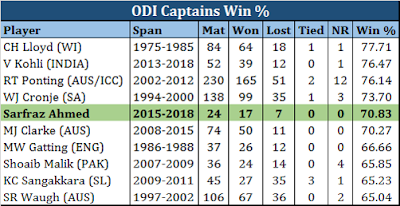 While these are still early days in his captaincy period, Sarfraz is ranked along side some legendary captains in ODIs with only a few of them with higher Win %. 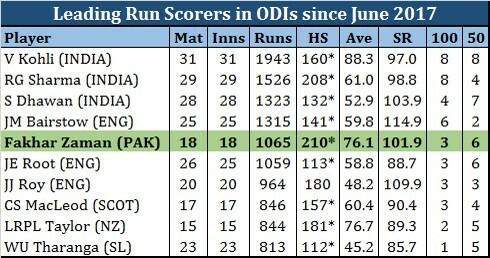 Fakhar Zaman is among the leading run scorers in ODIs since June 2017, which was when he made his international debut. While the Indian top 3 and Johnny Bairstow have outscored Fakhar during this period, Fakhar has the second best average among these batsmen, behind only Virat Kohli and equal to Ross Taylor. 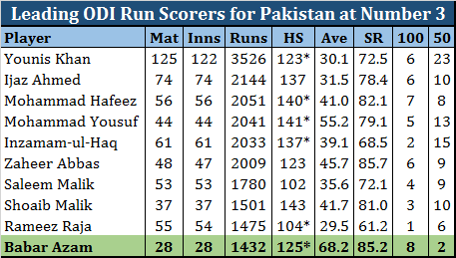 Fakhar is also among the only four batsmen with a strike rate above 100 during this period and he also has the highest ODI score of 210 during this period. Among the bowlers, Hasan Ali has been the pick from Pakistan. Overall, Hasan is the 6th highest wicket taker in ODIs since June 2017; however among the fast bowlers, he is only behind India's Jasprit Bumrah. More than his tally of wickets, it is Hasan's average, strike rate, and economy rate that stand out. He is miles ahead of all pace bowlers, and among all bowlers since June 2017, his metrics are bettered by only Afghanistan's wonderkid Rashid Khan. One batsman who always deserves a mention when talking about Pakistan's recent rise in ODI cricket is Babar Azam, arguably the best ODI batsman to ever play for Pakistan. While Fakhar has overshadowed Babar in the past year, it was Babar who had a dream run in the preceding years and he is still considered the cornerstone of Pakistan's batting line up. His frequency of scoring centuries, his ability to build innings, his defense, his attack, they are all sublime. Babar, in fact has scored more centuries at number 3 for Pakistan in ODIs in the history of Pakistan's ODI cricket. He is also the 10th batsman from Pakistan to score more than 1,000 runs at number 3 in ODIs and at the rate that he is going, it won't be long before Babar becomes Pakistan's leading run scorer at number 3, and maybe overall too! Pakistan have had a magical run for the past year, and if they can maintain this form for the next year then they will be one of the front runners for World Cup 2019! Thursday, August 23, 2018 This comment has been removed by the author. Monday, August 27, 2018 This comment has been removed by the author. If you want more info you can join Dream 11 Sports Guru Cricket and win daily. Every single detail will be known to you about the game you are playing. - Dream 11 Prediction Today.